In order to bring in new faces on public dealing posts, a major reshuffle in offices under the Deputy Commissioner is on the cards. The major focus will be on the estate office. 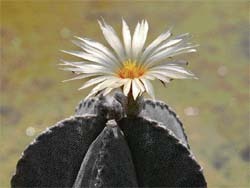 What can it be called, obligation or favouritism? The Chandigarh administration has flouted its own rules while appointing teachers on deputation. At the marriage ceremony of a local girl in Ludhiana last night, joy turned into sorrow when a shot fired in jubilition accidentally hit the cousin of the bride, Hemant Raj. The victim was a resident of Sector 20-A here. He was rushed to a hospital in Ludhiana, but could not be saved. The Chandigarh Transport Undertaking (CTU) hopes a significant jump in its revenue following its agreement with Punjab Roadways. The local police today arrested a Delhi resident with 100 gm of smack near Kisan Bhavan this afternoon. Ram Aggarwal, father of Bhimsen Aggarwal, state secretary of BJP Chandigarh, today breathed his last, here this morning. He suffered a massive heart attack. He was 70 years old. The cremation was held this afternoon at the cremation ground of Sector-25. Condemning the Kharar MLA Balbir Singh Sidhu for holding a protest outside the office of the deputy commissioner along with his supporters, vice-president of the Municipal Council Harman Preet Singh has demanded a case against the MLA for allegedly indulging in contempt of court. The general court martial(GCM) trying a colonel for alleged misappropriation of ammunition started its proceedings in the absence of defence counsel despite repeated requests by Col Vishal Bhargav to adjourn the proceedings briefly till his counsel, who was engaged in another trial, was available yesterday. 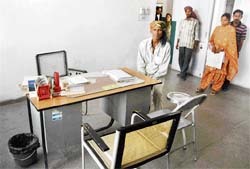 A sum of Rs 16 lakh has been spent on the renovation of the record room in the estate office here. Under the project, files have been put in special cabinets on the top floor of the building. The cabinets can be moved on a fixed rail so that enough circulation area was left around these. A senior official in the office said earlier the files were stacked in open racks and were exposed to vagaries of nature. 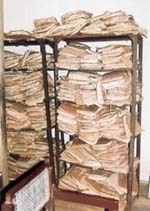 A file photo of files stacked in old racks. The Chandigarh Administration today said a dispute with residents of the Janata Colony over a wall being constructed on UT land, arising from lack of demarcation of boundaries, was resolved at a meeting between the Deputy Commissioners of Chandigarh and Mohali on July 3. The Kalka-New Delhi Shatabdi Express was today delayed for about 50 minutes in the morning. According to senior railway officials, the departure of the train was delayed as the power supply to the overhead electric wires was suspended. A three-member delegation of the CTU will go to Delhi to finalise the hologram to be used on bus passes. This follows the unearthing of a fake bus pass racket by the CTU officials. Two cars have been stolen from Phases V and X of Mohali. An incident of chain snatching took place in Sector 17 while a theft was reported from Sector 12, here, today. A truck driver, who had allegedly driven away with 18 tons of iron sheets from a local factory in Industrial Area last month using a fake registration number on his truck, was caught yesterday when he revisited the city to sell his booty. The local police arrested a youngster minutes after he snatched a purse from a woman on the road separating Sector 16 and 17 late last night. 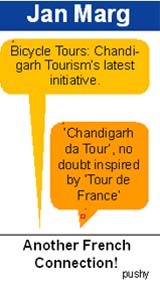 Students of the government schools of the city are in for a treat as the Chandigarh education department in association with the department of tourism and the Chandigarh industrial and tourism development corporation (CITCO) has chalked out a special trip for them. The department has planned to take them for local sight seeing and to the Light and Sound show at Government Museum, Sector 10. Panjab University vice-chancellor Prof R.C. Sobti, accompanied by dean, College Development Council, Prof S.K. Sharma, deputy registrar (secrecy), AR (general), office superintendent (fee checking) and students employees grievances redressal officer, visited Baba Kundar Singh College, Muhar, and Dashmesh Girls College in Badal district of Muktsar, to study the problems faced by the colleges affiliated to Panjab University in Ferozepur and Muktsar districts. Ambedkar Centre, Panjab University, Chandigarh, and Yuvsatta, an NGO working in Chandigarh slums, organised an orientation programme for marginalised women living in slums and villages of Chandigarh on the university campus here today. The joint commissioner, municipal corporation, Faridabad, Ballabgarh zone, today filed an affidavit before the Punjab and Haryana High Court stating that residential premises which were being used for commercial activities had been sealed following the court’s directions. Additional sessions judge J.R. Chauhan today granted anticipatory bail to Anand Prakash, a resident of Sector 7 in connection with a case about derogatory remarks published in his book about Mahatma Gandhi. Additional district and session judge, Bathinda, Raj Shekhar Atrri, has been posted as the additional district and session judge, Chandigarh, in place of B.K. Mehta, who has been transferred. Another district and session judge, Faridabad, Raj Rahul Garg, has been posted at the Chandigarh district courts. Noted poets from the region read out their verses on varied themes of socio-cultural relevance at a trilingual mushaira held by the Kidar Adabi Trust last evening at their official complex. The chief guest V.K. Sood and renowned sculptor Shiv Singh lighted a traditional lamp before the celebrated poet R.D. Taseer led the poets for casting mesmerising spells. The finance and contract committee (F&CC) of the Chandigarh municipal corporation today accorded approval to the installation of testing of gas chlorination system at various tube-wells and boosters in the city. The institute body of the PGIMER has given its nod for filling 400 posts, including faculty, paramedics, nurses and other supportive staff at super specialty centres like advance paediatric centre, advance eye centre, bone marrow centre and cardiac centre of the institute. Every morning at 8 am, patients from Dadu Majra - mostly daily wagers and those from poor socio-economic strata - line up at the government dispensary for medical check-up, hoping that they will be free by 9 am and go to their work. The Umeed project for the rehabilitation of the mentally challenged is being expanded. 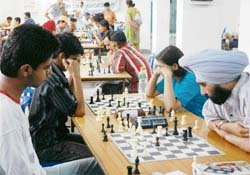 Himal Gusain of St Xavier's School, Sector 44, Chandigarh, emerged winner in the men's section with 6 points while Shweta of MCM DAV College, Chandigarh, grabbed first place in the women's section with 5 points in the 18th Chandigarh Chess Championship 2007. The Himachal volleyball teams (boys and girls) got a rousing welcome at the Kalka railway station, today. The girls’ team had won the bronze medal in a national-level youth tournament held at Kerala. 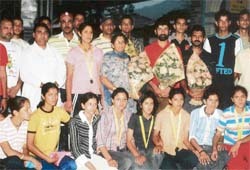 The teams, which reached the railway station at 5 am, were en-route to Shimla to attend a felicitation function. The HP volleyball teams at the Kalka railway station on Wednesday. Four city boys are among the 33 probables selected by the All-India Football Federation (AIFF) for a national coaching camp for u-16 to be held at Muragao (Goa) from May 15 to June 15. The Chandigarh Amateur Boxing Association has released its calendar for the 2007 - 08 session, here today. The association will select the city women’s team to participate in the All-India Open Women Boxing Championship to be held at Nainital from May 27 to 31. PCS and HCS officers yesterday called on home secretary to express concern over the handling of the vigilance probe that is looking into the role of the estate office in the non-compliance of orders of the adviser’s court to restore certain properties.